Running has been interesting lately. My weight has stabilized (thanks to ACV) so I don’t need to run to keep from gaining weight. Though this is a blessing, it is also a curse in some ways. It has become harder to get out each day and run in the heat when I don’t “have” to run to keep weight off. We also haven’t run any races since our half marathon in April. The reason for this is mainly because of my hip and back issues that have also been solved thanks to my Backjoy Posture+ seat cushion. So in some ways I have more reason to run. I don’t hurt anymore (for the most part) and I am thinner. Finally I have new shoes. I accidentally wrote that I had Wave Rider’s rather then Wave Precision in my last post. Either way, I’ve never run in a Mizuno shoe or in a shoe with a higher drop of 4mm. These have a 12mm drop and I can tell the difference. The first day I wore them was a bit of torture. My left heel would scuff the ground as I ran, which I assume was left over from my hip issue. Also they have a much more cushioned heel, so I had to almost learn to run all over again. That first run in 100 degree HI was difficult. Yesterday was my second run in these shoes and it went so much better. It was much cooler out and I ran well with no scuffing of my heel. I wound up my 4 mile run at nearly a 8:30 pace which I haven’t seen since the heat kicked in. So new shoes, less weight, little to no pain. I should be training for a marathon rather than dreading the next run. I chalk all my lack of desire up to the summer doldrums. 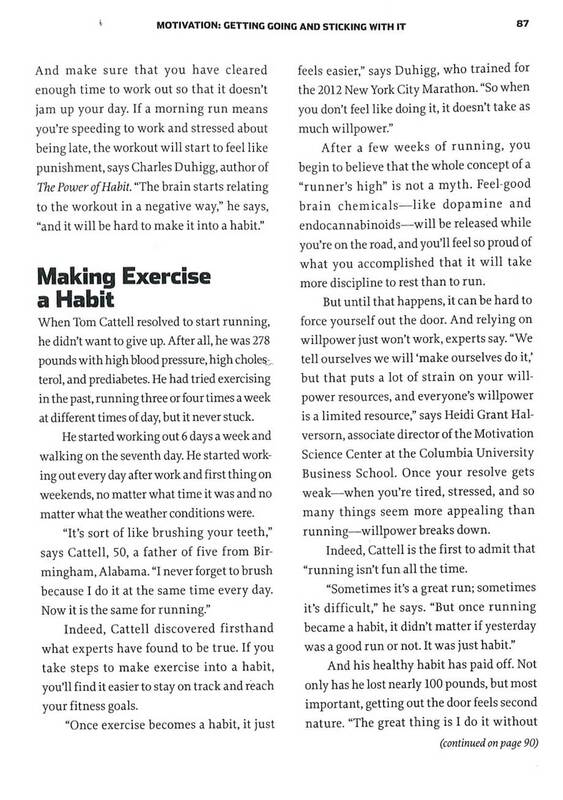 THIS is the reason to make exercise a habit as I wrote for my section in the Runner’s World Big Book of Running (Link). My running isn’t based on a feeling. It is based on a habit. So whether I want to or not, hot or cold, I go out each day for my run. Running has been interesting lately. I’m glad I run! Runner’s World book and tapering! I have never gone this long without writing on this blog. Mainly I have been a bit worn out lately and it has been all I could do to run and watch the Boston Marathon (not disappointing). I consider this a “blog taper”. Sometimes I guess everyone needs to slow down and let the muscles recharge, whether the muscle is a leg or a brain. Saturday is the Country Music Marathon in Nashville. TJ, RS and I will all run the half and – for the most part – I am looking forward to it. I have never run in a race with more then about 5,000 people, so going to one that is 5x that, should be… well… interesting. We leave tomorrow at lunch, go to the expo, go to the hotel, get up at 4:00AM, get to the race at 5:30AM, and hope to be ready for the 7:00AM start. Of course there are 40 corals, so we may not get going until 8:00, but it will give us time to prepare mentally. On to my book article. 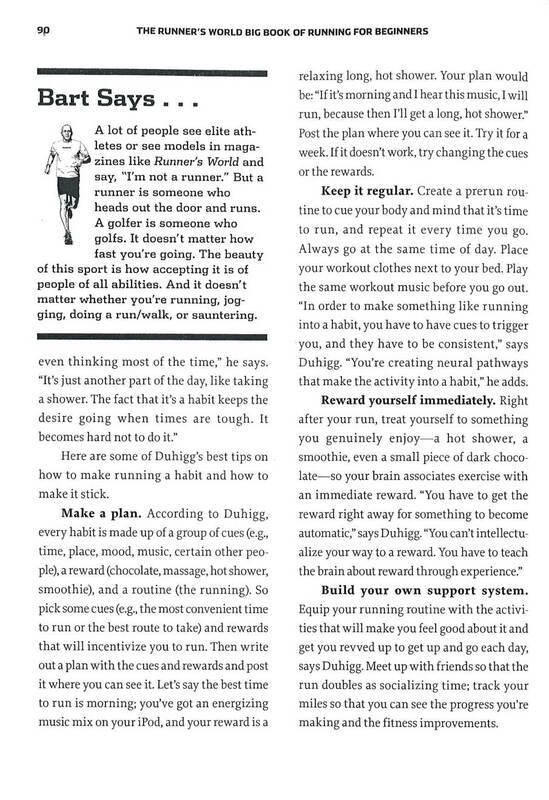 I mentioned last Saturday in my last post that I am in a Runner’s World book. 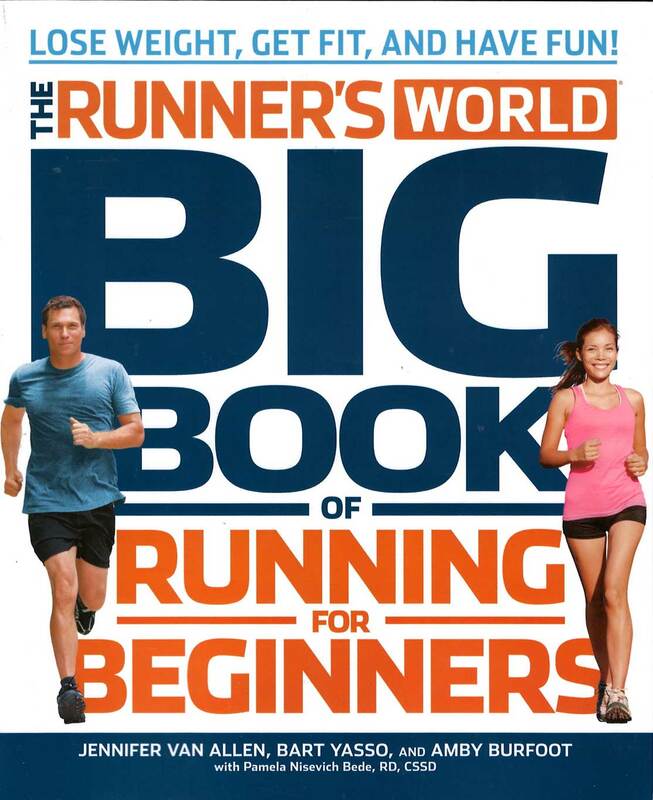 Actually they put me in two books, the other is called, “Runner’s World Training Journal for Beginners”. So here is my section. Thanks for reading and for following my blog! #17 is the mountain road run that TJ and I ran on Saturday. Wow, I only have 26 more to go before I give up running. How can I get all those in in only 50 years? I’ll figure out a way. Not far from downtown Birmingham, Peavine Falls Road provides a hilly, serpentine three-mile route through Oak Mountain State Park. So we have run the run. There is a race that will be run on the 4th of July this year up to the top and back down. I think I’m in! Anyway, just thought I’d share that little bit of news. It is exciting to think that I ran this before I even knew it was a Runners World run. It was a good run yesterday, for the most part. I ran the first 11 miles at close to a 9:00 pace. I honestly didn’t feel like I was pushing it much, but I guess I was. I tired to keep with my app, but I kept going too fast by the end of each split. So, 11 miles went great. Then I came to mile 12. I lost all strength. It hit me out of left field. I suddenly had very little strength left. I ended up walking some of the 12th and 13th mile. I decided that rather than pushing myself, I would be glad I had a good run and head home. I realized a couple things after yesterday’s run. First, I pushed it too hard for the first 11 miles. Even though my perceived effort was low and I felt great, it was more than my system could handle. I should not have crashed as I did. Had I tried to keep my pace a little slower, I could have finished the course. As it was I ran 13 out of the 15 miles planned. Second, I need to work on keeping my energy level up by taking some type of energy gel during my run. I read an article the other day that said, if you wait until you feel tired before you take a gel or drink gatorade, it is too late. Made sense. It said to start taking a little gel about 30 minutes into your run and then take more ever 15 minutes. Obviously you wouldn’t want to take a full gel every 15 minutes, but about a quarter of one each 15 minuted will keep your energy up throughout the race. Last, I hurt my hip yesterday. I knew it was aching during my run, but that has happened before and not been a problem. Yesterday though, I was in quite a lot of pain about an hour after my run. It still hurts today. Since today is my off day, I am going to see how it feels after a day of rest and go from there. Based on my research, it sounds like it is my hip flexor that is inflamed. I am sure it was caused several weeks ago when I tripped on the sidewalk running. I hope it will get better on its own, but if not, I’ll see some type of doctor this week. Not good timing as I was just getting back into running well again. So the ups and downs of my long run. The encouraging thing to me was the fact I am getting back to my Spring pace and had an overall good run. I just hope my second wind isn’t too close to the marathon that I run out of time. Saturday, the Retro Run in Birmingham. It is a fun 5K that we did last year. Hopefully I’ll be all better and ready to run! Going to see Neill (@bigbiggeek) there and about 5 other people I know (plus TJ and RS will run). Can’t wait. Very interesting article about losing weight with exercise! Scientists in Australia claim to have discovered the exercise technique that burns the maximum amount of fat with the least amount of work. I really liked this article about tempo runs. 3 more days and I’ll be back out there!!! 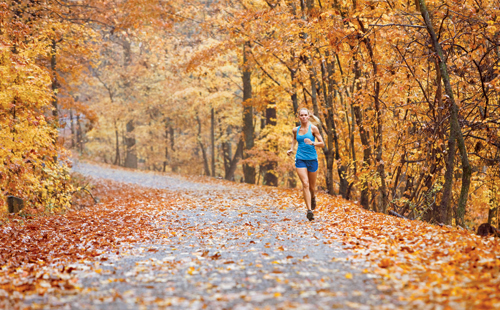 Learn How To Do A Perfect Tempo Run From Runners World.com | Runners World & Running Times.